Sailing has been a popular form of outdoor recreation on the sounds, lakes, and rivers of North Carolina since the days when handmade log canoes were the most common boats in use. Initially, the canoes were hollowed out from single logs of native juniper or cypress in much the same manner as that employed by the native Indians. As boat builders became more proficient, they experimented by splitting a log down the middle and adding timbers to make their canoes wider and lighter, with more stability and capacity. After sawmills were introduced to colonial North Carolina, sailboats made with milled lumber replaced the log canoes, sometimes known as "kunners." As late as the early part of the twentieth century, however, watermen were still using the log canoes. It appears that it was not unusual for such old-timers to be challenged to race against the more modern craft that plied North Carolina waters: sharpies, spritsail skiffs, and even shad boats. People who spend most of their lives on the water tend to develop the same kind of attachment for their boats-especially those they designed or built themselves-as cowboys do for their horses. Traditionally, their bragging and challenging has often resulted in spirited sailboat races. In his 1975 book, The Kinnakeeter, Charles T. Williams II said the fishermen of Avon "were always arguing who had the fastest skiff," which often resulted in Saturday sail skiff races on Pamlico Sound that drew crowds of onlookers. Williams traced this back to the 1890s, as did others who told of similar races in the Beaufort area, often with native watermen competing against seasonal visitors. Elizabeth City and the Pasquotank River became a center of sailboat racing in the 1930s after a waterman named Joel Van Sant, the captain of a yacht stopping off there for repairs, designed what was described as "a small, cheap, easy to build boat that could be designed and built by amateurs and . . . used for sailing in shallow and shoal bodies of water where other types of sail boats could not be adapted." This was the moth boat, and interest in the new design grew rapidly. Only three years after Van Sant built the first one, a National Moth Boat Association was formed in Elizabeth City to take care of the hundreds of inquiries that were pouring in regarding plans, specifications, and measurements for the popular new boat. Soon moth boat regattas were being held annually in Elizabeth City. Moth boat clubs were formed in Florida, Atlantic City, and elsewhere, and by 1938 there were more than 1,500 registered moth boats worldwide, including several owned by the Greensboro Boy Scouts and a fleet in Charlotte. The Pamlico County town of Oriental developed sailing fever in the early 1960s, and its Oriental Sailing Social was so successful that it became an annual affair. More recent sailing races and regattas in the large man-made lakes created in this century, as well as in the more traditional coastal area rivers and sounds, involve boats that are quite different from the old log canoes. Many are modern sailing yachts, 30 to 40 feet in length, though a few have been designed especially for racing. With the tremendous increase in the use of North Carolina waters by sailboats, there still is spirited competition between owners of a wide variety of new types of small craft. Most sailboats used for recreational purposes until fairly recent times were built as workboats, though many were also used for transportation or family outings. Even before the Civil War, popular forms of recreation at the sound-side resort of Nags Head included sailing to Roanoke Island or fishing expeditions to Oregon Inlet. When the 300-room New Atlantic Hotel was built at Morehead City in 1880, one of its advertised attractions was moonlight sailing on Bogue Sound and sailboat excursions to Cape Lookout. Today, nearly all of the many thousands of sailboats in North Carolina waters were built solely for recreational use. 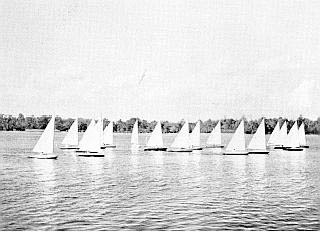 "Moth Boat Regatta on Pasquotank River, c.1940." Image courtesy of the Museum of the Albemarle. Thank you -- we've made the change.